Help us to discover future talent, reward innovation and recognise achievements of both individuals and companies from across the workplace and facilities management profession. 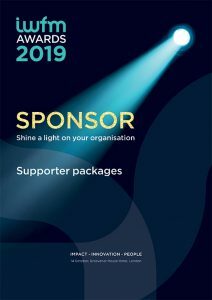 Established as our industry’s annual highlight, make sure your company is associated with excellence, innovation and the true impact of facilities management through sponsoring the 2019 IWFM Awards. The 2019 Award Winners will be announced at the Awards Ceremony on the 14 October at the Grosvenor House Hotel, London, attended by the ‘Who’s Who’ of the profession. This glittering black tie event, attracts near 1,200 leading figures and decision makers from across the workplace and facilities management sector at this night of celebration. By sponsoring any aspect of the IWFM Awards you’re highlighting that your company recognises workplace and facilities management expertise and the key role that facilities management plays in the success of organisations throughout the UK and the world. Your company will also receive unrivalled opportunities to promote your business to the workplace and facilities management sector. For further details on available opportunities and how you can be part of the IWFM Awards explore our sponsor brochure above or contact the team on +44 (0)1279 712675 or corporate@iwfm.org.uk.